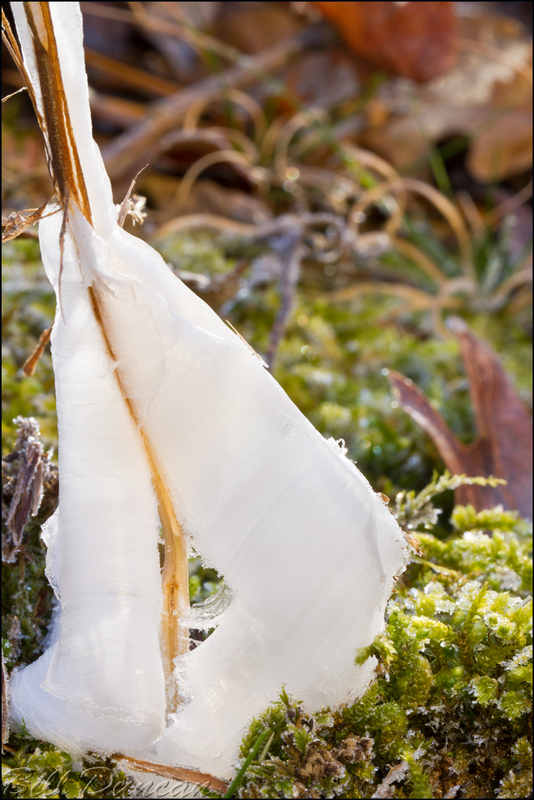 I spent a fantastic Saturday hiking and making images in the Missouri Ozarks yesterday. Any day, even a bad day, in nature beats about anything else I can think of doing. Some days I barely take the camera out of the bag, instead concentrating on hiking, birding, botanizing, etc… Other days, like yesterday, it took me close to six hours to hike the North loop of the Whispering Pine Trail of Hawn SP because I stopped so often to set up the camera or observe some wildlife. 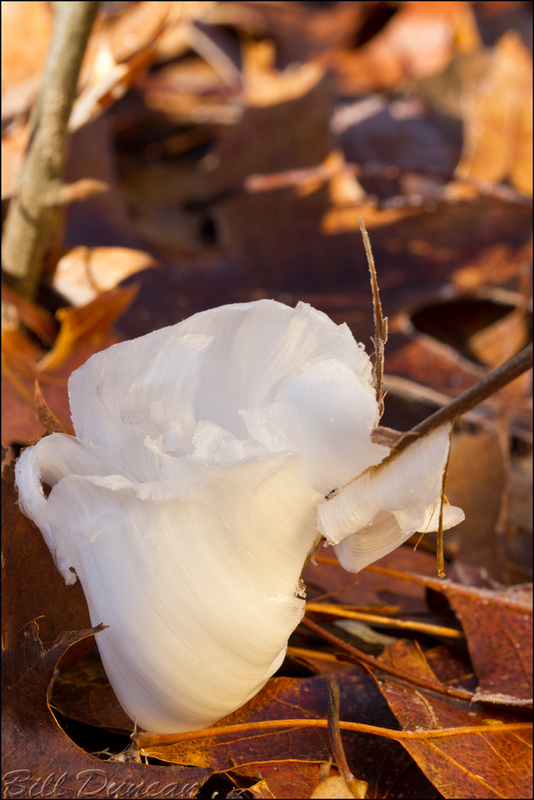 My primary photographic subject turned out to be these exquisite crystallofolia, or “frost flowers”. I have wanted to get some pictures of these things for a while now but they can be quite difficult to find, needing specific requirements to form. I could spend a few paragraphs attempting to explain this mysterious and ephemeral natural wonder. Instead, I will lead you to the well-written document by Missouri’s own Ted MacRae. 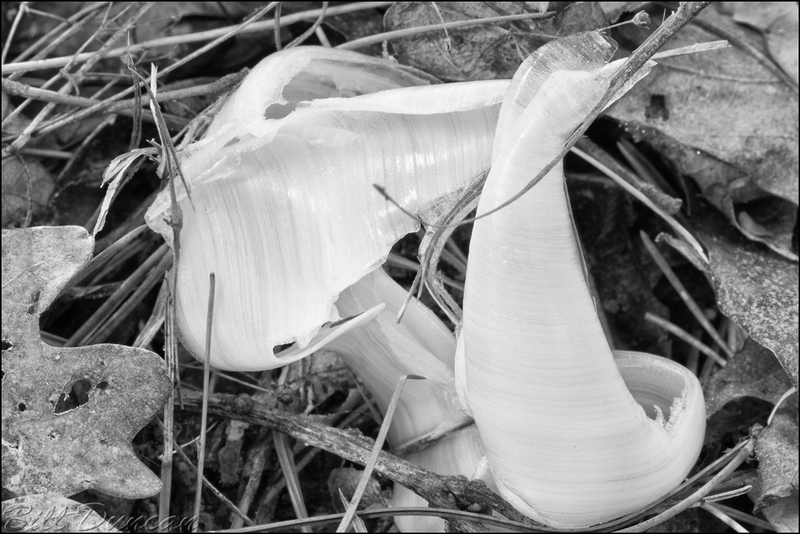 As the title of this post suggests, Hawn SP is a destination of mine at least once a season. I have rarely visited this spot in Ste Genevieve County and gone home without seeing something new, something extraordinary or at least come away renewed. There are no shortages of photographic potentials and it is one of the closest spots to St. Louis where I really feel I have gotten away from it all. Even on the busiest days it is rare to come across other people on the trail. Getting near the trailhead on the way back I heard some rustling in the leaves. I followed the sound to what at first looked like a large opossum. I was pleasantly surprised to find it was an armadillo! 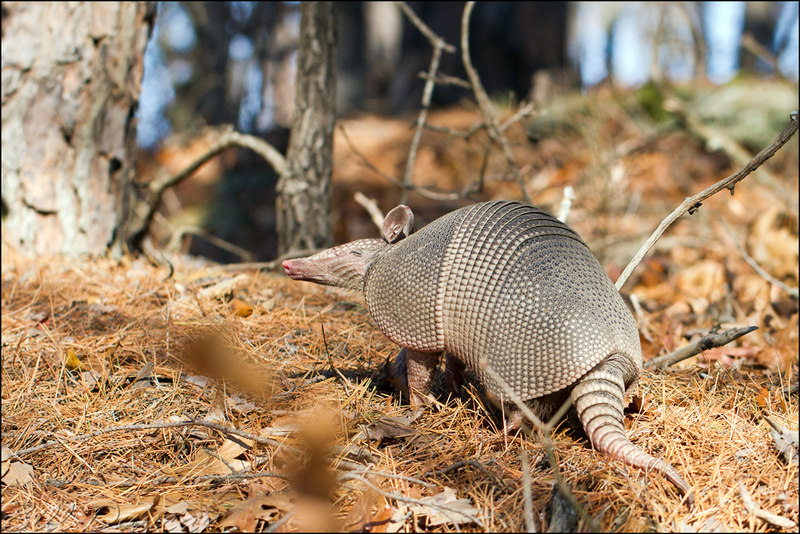 This was the first live armadillo I’ve seen and photographed. When I came across this guy my camera was of course attached to my tripod and strapped to my pack. I had Canon’s new 100mm f2.8 macro L lens attached at the time. I did not think I had much time before this guy slipped up and over the ridge she was heading up where I would lose her to the poor light on the north-facing side. Therefore, I did not try and swap lenses to something a little more useful for this type of encounter such as the 70-200mm or 400mm. Of course when focus is sharp, this lens has no equivalent in sharpness and image quality; however, autofocusing this lens under this situation was challenging to say the least. I’ve read reviews saying this lens was a slow dog for autofocus, but that’s not what we buy macro lenses for, is it? Anyway, besides a larger portion of focus failures than I’m accustomed to, I guess I managed to grab a few images that I am relatively happy with. 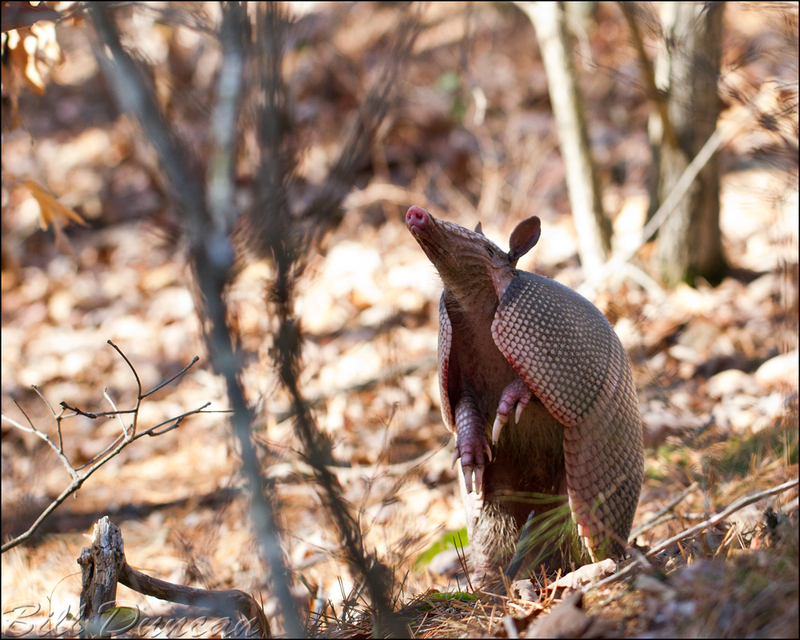 Like many small mammals in the Missouri Ozarks, Armadillos have poor eyesight and must rely on their hearing and smell. The section of the trail where this took place had a fair number of Oaks and of course at this time of year the forest floor was covered with a noisy blanket of dry fallen leaves. I made enough of a racket running up the hillside that she was definitely aware someone was following her. She often stopped and listened and as the previous image shows, she would raise up on her hind legs to get a good whiff of the potential predator on her tail. Thankfully, I’ve been told I smell almost exactly like an armadillo, so she probably was not too alarmed by my presence. As usual, I reluctantly left Hawn in the early afternoon and proceeded to my evening destination – Hughes Mountain Natural Area, which is another place that never disappoints (although I still haven’t had too many interesting skies like I hope for). I knew there would be a full-moon rising shortly after sunset and had a few poorly conceived ideas about what I wanted to do. I took some images of the sunset and watched as the brightest, reddest and coldest moon I have ever seen rise almost directly opposite the sky from the sun. In the end, it got too cold too quickly. I played around with the moon in some images but I doubt I got anything I’ll be happy with. I believe this image is showing the four hills that make up Buford Mountain and Bald Knob to the South-west of Hughes Mountain. I’m still not close to have the sunrise/sunset images I’m looking for from Hughes Mountain. One of these days everything will line up and I will hopefully get closer to what I am after. Overall, another fantastic day. I’ll be trying to rest my legs today.